This command doesn't do what you think it does. Since (1 <= t) is either true or false, which when compared to a double precision number are treated as 1 or 0, this expression is always true no matter what t is. This will return true if t is greater than or equal to 1 and less than or equal to 50. With that out of the way, show us what you've tried to do to solve this problem and ask a specific question about where you're having difficulty and we may be able to offer some guidance. @Abdullaziz Errayes: If you have saved this code to a script file, nothing happens, because the function main() is not called at all. Remove the first two lines and the code will run. "a function into which you pass the end time and time step size" sounds like your function should take 2 input arguments, and not two input commands. Remember that Matlab's ODE integrators (as many other tools also) can handle smooth functions only: The automatic step size control gets deeply confused if the function to be integrated is not differentiable. See http://www.mathworks.com/matlabcentral/answers/59582#answer_72047. If you are lucky, the integrator stops with an error, but without luck, you get a result, which is dominated by the accumulated rounding error, because the step size is reduced until the discontinuity is hidden by the truncation error. If the discontinuity depends of a certain position, use an event function to stop the integration and a while loop until t(end) is the wanted final time. then I posted my answer, no need for ode45. and now you add that 'maybe' (!?) 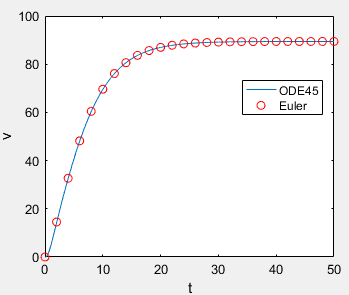 a simple euler method suffices ..
either you need ode45, or you don't, what's going to be? "you went for ode45" - wrong. The OP Abdullaziz Errayes has mentioned ODE45 and I've explained the common pitfall of integrating a discontinuous function with a step size controlled method. The final v with the Euler method is 89.4393, with ODE45 it is 89.4113, your value is about 810 according to the diagram. I suggest to cross-check your suggestion instead of posting a pointless comment. How does the Torque and its integral look like? As expected the dominant term of the velocity, with the equation you use, is the Torque. 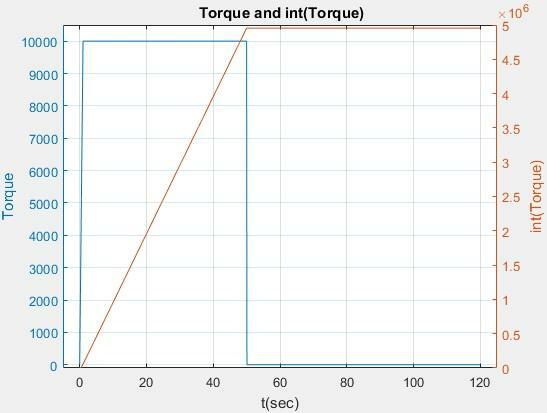 Torque is roughly proportional to fuel (or battery charge) consumption. But your equation is for an ideal model, with the vehicle on flat terrain. In reality, only with certain minimum downhill angle, and not even with brand new bearings and everything working well, air drag, friction continuously reduces gained velocity thus further torque is required to keep speed constant. if you find this answer useful would you please be so kind to consider marking my answer as Accepted Answer?